It’s simple — how many bootcamp check-ins can you get this fall? The Holidays are fast approaching and that means lots of big, delicious meals topped with tons of parties and get-togethers. Even if you take only a few bites of that scrumptious stuff — it adds up! We are trying to set you up for at least a way to even it all out with extra workouts and calorie burning. For peat’s sake, it’s better to at least keep your weight even (plateau) rather than pack on those Holiday lbs. and have more to lose right before summer. Right?! We strongly encourage you to check out other camps and trainers. For the fall, the drop-in rate is only $5! There is so much to learn from other trainers and your body will love you for it. A few weeks back one of our campers went to her 2 usual pm classes, then a class in another town and an am class — 4 classes in 1 week! Whoop! Prizes will be huge… especially for those that never miss a class for this challenge! 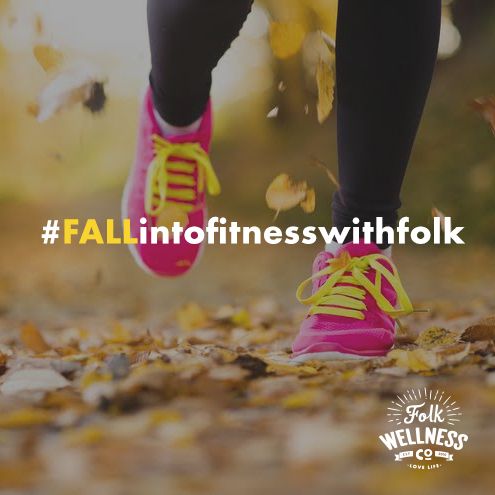 We would love to see pics posted and shared and please don’t forget to hashtag us: #fallintofitnesswithfolk and tag us: @folkwellnessco (on facebook) and/or @folkwellness (on instagram).